It’s that time of year again! Warm weather brings bears out of their dens and looking for food. It is safe to assume that they will be hungry. Bird seed can provide a lot of calories to a hungry bear! Working with data provided by Conservation Officers, we are pleased to provide practical tips for reducing conflict with bears in your yard. Follow these simple steps to ensure that your feeders don’t become part of the problem. Read about living with bears here. Read about living with rodents here. Read about living with birds here. Read about living with foxes. Read about living with cougars here. Read about living with wolves here. Read about living with coyotes here. Many of us enjoy seeing wildlife. We are delighted when a fox meanders through the backyard, a coyote crosses the road and the birds are at the feeder. We bring binoculars and cameras on our outings, hoping to spot a furry friend. Many tourism industries are designed around wildlife viewing. Most animals will get used (habituated) to humans and human developments if they get close even once or twice without a negative outcome. That's why you see the fox, who is VERY good at not being seen, in the yard. Once the animal is habituated it may become quite bold. That's when you see the fox lying in your vegetable patch having a nap after raiding the vole population that was living underneath it. And the bear helping itself to your chickens, compost and garbage. This is a little too close for most peoples' comfort. Wildlife that gets a reward from your yard (or the dump etc etc.) has become food conditioned and is now a danger to humans. Bears, for example, may defend a resource aggressively when they find one. This video shows a perfect example of a food conditioned bear. These viewers should have driven away long before the bear approached their vehicle. Lack of negative consequence for the bear just reinforced its perception that humans are safe and a good source of food. Reacting to these situations is often time consuming and a drain on government funds which could be directed towards conservation and education. So preventing this situation is the key to coexisting peacefully with wildlife! Simple, yes? Here are some tips that help prevent negative encounters. 1. Attractant management is key. Garbage, compost, petroleum products, feed, livestock and food grown in our gardens are all wildlife attractants. Our own mess is the biggest contributor to human-wildlife conflict. Waste management is a shared responsibility. We can make sure attractants are not accessible on our own properties and we can encourage municipalities to create and maintain wildlife friendly waste management systems. Electric fencing is inexpensive, easy to install and saves replacing valuable feed and livestock and prevents destruction of wildlife. Scroll down to find a backyard checklist that will help you manage attractants on your property and information about electric fencing. 2. Keep your distance. Wildlife viewing can be interesting and fun. We are tempted to stop and take photos on the side of the road or even when we encounter an animal along the trail. Please keep your encounters brief and maintain as much distance as possible. Don't get out of your car to take that photo and when you encounter a bear on the trail, back away and tell the bear you are leaving; this is not a good time to take a photo. 3. Don't feed the wildlife! Leaving food out for foxes and other animals is a death sentence for them and asking for trouble for you. Conservation Officers may issue a Dangerous Wildlife Protection Order if they determine that you are not managing attractants on your property appropriately. Scroll down the page for more information about how to make your yard safe. 4. Travel through wilderness areas carefully and consciously. When you are exploring wilderness areas you are likely to encounter animals. Plan on it. Pack all food and cosmetics in bear proof canisters. Cook food far from your sleeping area and don't sleep in clothes you have cooked in. Carry bear spray and know how to use it. It is important to report wildlife sightings and encounters when they pose a risk to humans or to the wildlife sighted. Reporting sightings and encounters may help scientists understand wildlife populations and behavior. Conservation officers can respond quickly to negative encounters and are able to make other people in the area aware of what is happening and what to do to stay safe. Please visit Environment Yukon HERE for more information about the TIPP line and when to report. Store garbage securely indoors or in certified bear-proof containers. Put bins out the morning of pickup with lids tightly closed (same for compost); or take it to the dump before it becomes smelly. Compost: Add only fruits and vegetables to your backyard compost, turn it regularly, and add firewood ash/dead leaves to keep odors down. Consider keeping your compost in an area protected by an electric fence or electric netting. Freezers and Food Storage: Keep freezers and all food in your house or in a secure, locked shed. Meat or Fish Dryers and Smokers: Use them in a secure locked shed, and clean the shed right after you’re done. BBQ: Burn the grill clean after each use. Remove the grease can. Keep covered and preferably concealed. Bird feeders: Feed birds only in winter — (this keeps bears away from feeders and cats away from birds). Gas and Oil Products: Seems absurd, but bears are attracted to many petroleum based products! Store gas, diesel, waste oil, fertilizer, etc in well-sealed containers and in a secure locked shed. Managing human garbage and other wildlife attractants is the most effective way of reducing human-wildlife conflict. Everyone produces waste at home, at work, every time we purchase a product that is packaged and/or transported. Wastes include garbage, recycling, compost and hazardous materials and all may be attractive to wildlife. Reducing the amount of waste we produce and the number of negative encounters with wildlife both equals savings for tax payers, governments and businesses and helps keep wildlife wild, alive, and contributing their valuable ecosystem services. In Whitehorse, our municipal government provides waste containers and curbside collection within the city limits and manages the municipal landfill. The Wildlife Act gives Yukon Government the authority to enforce regulations which protect wildlife, including regulations concerning the appropriate storage and disposal of wildlife attractants. Please check back here over the coming weeks as we populate this page with resources to help individuals, decision makers and governments choose waste management options which are safe for wildlife and humans. Yep, that's right, BEAR PROOF COMPOSTING! Bears love compost piles because they're full of food. Even if they don't stink, bears like 'em and will get into them, thinking nothing of tearing your carefully constructed composter apart and finding the goods. And if they get a reward the first time they do it, they'll be back! Nobody likes a food-conditioned bear. They are dangerous and at risk for being needlessly destroyed. There are two ways that we can think of to deal with this situation. 1. Put an electric fence around your compost pile. One large perimeter electric fence can contain your livestock, feed shed and compost pile all in one. Alternately, a smaller fence can be put up just for your compost pile. 2. BUILD THIS! This is a truly creative solution for those of you who love to make your own compost and don't love to work with electric fencing. Canmore, AB...a step or two ahead of us in reducing HWC and managing wastes. WildWise Yukon promotes the use of electric fencing for small and large scale agricultural and industrial applications as well as to secure temporary attractants like fish camps and meat caches. Electric fencing is relatively inexpensive, easy to install and effective at preventing negative encounters with wildlife. Electric fencing may be used to keep livestock in and wildlife out and may be set up on a temporary or permanent basis. It just makes sense! Here are some very convincing documents for you to share with your neighbors and friends. Please contact us if you would like us to print some of these for distribution through your store or organization. A Bear Risk Assessment for Yukon Place. Why are you talking about my pets? Fair question. Wildlife can easily become used to seeing, smelling and hearing pets on or off-leash and become bolder and bolder, approaching humans and pets on trails in in our own backyards. Food conditioning happens when wildlife get a reward from a food source (like our garbage bins, smokers, outdoor freezers, dog bones) and usually results in the animal returning for another reward and sometimes aggressively defending the reward they have found. A food conditioned wild animal is a dangerous one. Every year pets are killed or injured by wolves, foxes, coyotes, bears and other wildlife. Wildlife are unnecessarily destroyed every year when they approach human settlements looking for food. The good news is, it is not hard to keep both pets and wildlife safe and everyone benefits when we do. Please read this article, written by Sarah Elmelegie, a biologist in Canmore Alberta. She points out some of the current scientific findings about the stress related impacts of off-leash pets on wildlife and our responsibilities as pet owners. Note that off-leash dogs are the second highest risk enhancing human-behaviour recorded at the time of bear attacks in North America! Sarah's article: Why dogs belong on a leash outdoors. 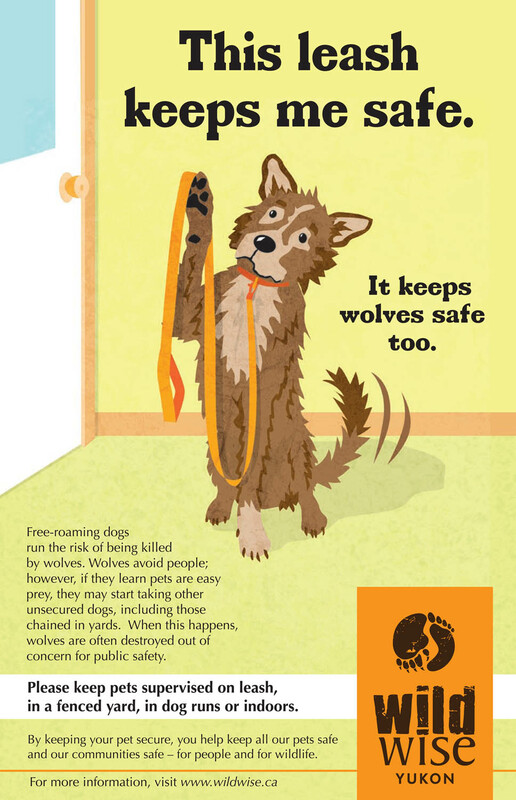 WildWise Yukon, with support from Yukon Government and the Community Development Fund, has designed a series of posters intended to encourage and remind people to keep both wildlife and pets safe by securing their furry loved ones. Practicing responsible pet ownership includes ensuring that our pets are safe and secure from predators. Secure enclosures, walking dogs on a leash and bringing our pets inside are all simple steps toward this goal. Practicing responsible environmental stewardship involves keeping wildlife wild and alive. We hope our posters act as a reminder and an invitation to help us take simple steps to make Whitehorse safe for people, pets and wildlife. CBC article about causes of bear attacks in BC notes that more attacks are the result of off-leash dogs than bears protecting food resources. 35 flock owners have reported conflict with wildlife involving their coops since 2012. Over 70% of those conflicts were with bears. Grizzlies seem to have a particular taste for chicken. In 2018, we enrolled four Whitehorse area flock owners in our Bear Safe Egg Producer Program. We wanted to find out what supports egg producers need to keep their flock safe from bears and bears safe from their flock. We developed criteria for being a Bear Safe Egg Producer, helped participants design, finding funding for and install electric fencing and gathered feedback from them all about the program. now do you want to become a wildwise certified bear safe egg producer? We also found out that flock owners have a big job on their hands looking after the health and well-being of their flock. We came across some very helpful resources along the way. If you have chickens or are planning a chicken coop, you may find these come in handy.